Making sense of a tough investment choice between two of the best large banks in the U.S.
For good reason, Wells Fargo (NYSE:WFC) and JPMorgan Chase (NYSE:JPM) are widely considered the cream of the crop when it comes to the U.S. megabanks. Investors would be hard-pressed to find two bank stocks that could match the scale, stability, and long-term performance of these two stalwarts. If forced to pick one, however, which would you choose? To help unravel this challenging decision, let's walk through the choices step by step. 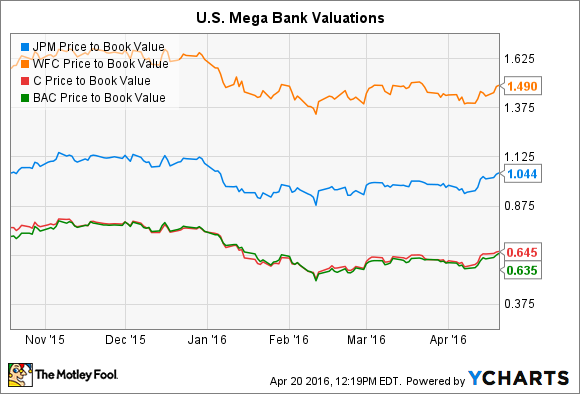 For and against Wells Fargo: How much is too much to pay for an amazing stock? To see how bright Wells Fargo truly shines, we must start with its income statement. JPMorgan and Wells have similar profits, $5.52 billion and $5.46 billion, respectively, in the first quarter of 2016. However, Wells Fargo is able to generate those profits with 24% fewer total assets than JPMorgan. That efficiency helped to drive Wells' 11.75% return on equity for the quarter. Wells was the only megabank to produce a quarterly ROE above 10%. Wells also sports a better dividend yield than JPMorgan, currently at 3.11% versus 2.84%, respectively. Beyond the attractive financial results, Wells also has a simpler business philosophy than JPMorgan. This is an important consideration because it makes it easier for investors to understand what makes the company tick, as well as what risks could be cause problems in the future. Wells' primary focus is providing credit to consumer and commercial borrowers in the U.S. It supplements that with relatively simple, common-sense products to address the financial needs of its consumer and small business customers. For example, Wells' biggest business is making mortgage loans to consumers, and that's supported by the bank's wealth management products, an area of particularly strong performance over the past several years. You won't find a significant portfolio of complex derivatives on the Wells Fargo balance sheet, nor a large organization focused on trading or market making. Trading revenues were just 0.9% of the bank's first-quarter revenue, a minuscule level compared to JPMorgan's 22.4%. To be sure, Wells Fargo is an exceedingly complex financial institution. That's a fact of life for a multitrillion-dollar bank. However, the path from consumer to revenue to profits is much easier to grasp in the Wells Fargo model compared to many of JPMorgan's more sophisticated businesses. It's difficult to find any major fundamental problems with Wells Fargo today. However, from an investing perspective, the bank's valuation could be considered a bit on the pricey side. Wells currently trades at 1.5 times its book value, 50% higher than JPMorgan and more than double the level of the two other megabanks, Citigroup and Bank of America . JPM Price to Book Value data by YCharts. An investment in Wells Fargo is certainly an investment in a quality company, but the more challenging question is assessing if the bank deserves such a rich premium compared to its competitors. Where Wells Fargo succeeds with efficiency and a simple focus on U.S. consumers, JPMorgan excels with diverse revenue streams, a global focus, and a commitment to consistency. For the 2015 fiscal year, JPMorgan led the nation's largest banks in total profits and tangible book value per share growth. It was second only to Wells Fargo in return on tangible common equity, growing earnings per share 13%. Over the past 10 years, JPMorgan 10% compounded annual growth rate in earnings per share exceeds all of the other megasized U.S. banks. For context, Wells Fargo's earnings-per-share CAGR was 6% over this period, Bank of America's was negative 11%, and Citigroup was an abysmal negative 20%. In addition to its lending business, JPMorgan has a broader source of additional non-interest revenue streams than Wells. It has an industry-leading investment bank, a global commercial bank providing services to the largest and most sophisticated corporations around the world, a payment processing division, and more. Beyond the fundamentals, the most attractive aspect of JPMorgan from an investing standpoint is arguably its low valuation, currently just 1.05 times book value. The bank's 9% return on equity in the first quarter was 23% less than Wells Fargo, yet JPMorgan's stock trades at a 33% lower valuation. The reason for this discrepancy is likely driven by two primary factors in today's environment. First, JPMorgan is classified at a higher regulatory level among the global systemically important financial institutions (SIFI) in the U.S.
JPMorgan and U.K.-based HSBC are in the highest echelon of the SIFI ranking system in the world, forcing each bank to carry an additional 2.5% of capital above normal regulatory requirements. Citigroup is classified one level down, requiring at additional 2% capital buffer. Bank of America requires a 1.5% extra buffer, and Wells Fargo a 1% buffer. Higher capital requirements limit a bank's ability to generate returns and provide capital distributions to shareholders. Second, JPMorgan's reliance on trading to drive top-line revenue is currently under the microscope following the tough conditions and poor performance in the first quarter. That volatility was primarily driven by concerns about the global economy, centered on China. The markets, analysts, and even JPMorgan management recognize that further volatility would be a major headwind for this important business at the bank. CEO Jamie Dimon addressed the problems head on in his 2015 letter to shareholders, predicting that a recession in China could hit JPMorgan's bottom line to the tune of $4.5 billion thanks to market turmoil, trading losses, and loan defaults. The possibility of a Chinese recession is considered low by most experts, but regardless, the concern is not helping the stock's valuation. So, which bank is the better buy today? To me, it would be hard to fault an investor for buying either of these stocks. Both are run by elite management teams at the very top of the industry. JPMorgan and Wells were arguably the biggest winners among large bank stocks emerging from the financial crisis, a testament to their sound financials, strategies, and leaders. In the long term, I think both stocks will do quite well. If forced to choose only one, my pick would have to be JPMorgan based on its significantly lower valuation today compared to Wells Fargo's. The lower valuation gives long-term investors an extra margin of safety, a key consideration of top value investors. To me, the lower valuation gives an extra bang for your investment buck while also reducing the risk of Wells' pricey value. However, over the long term, I don't think you'll go wrong with either of these two premium bank stocks.